Anyone who knows me can probably tell you that I am a major fan of Lebanese food. When I was at uni in Cardiff, I basically lived off the stuff. I would order lamb kofte and fattoush salad several times a week. I mean, I was seeing the delivery driver more often than my family at that point. So, you can imagine my sorrow when I graduated from uni and moved back to Devon only to discover that there was nowhere to get my weekly fix of delicious Lebanese goodness. 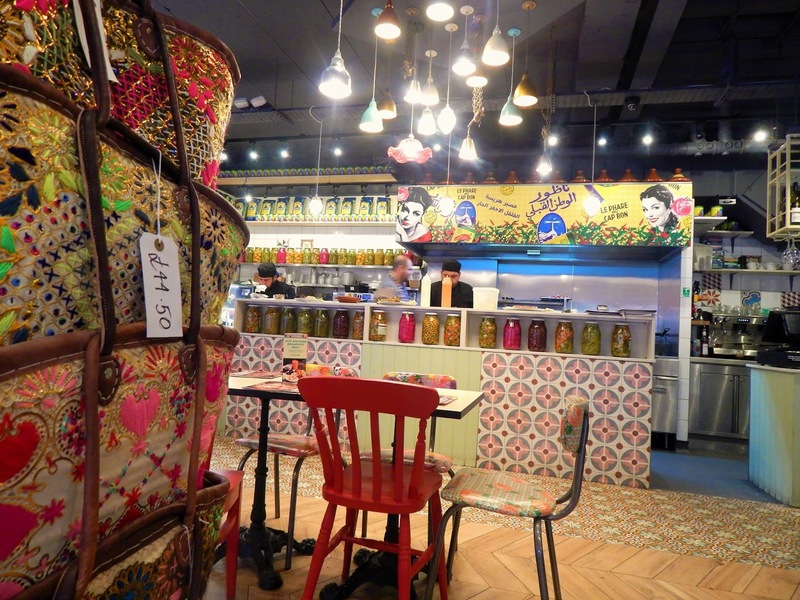 But that all changed when I stumbled upon Comptoir Libanais in Guildhall, Exeter. This was the kinda place that I had been searching for. The interior is so vibrant and exciting - it is like stepping into a Middle Eastern palace. The menu is full of all my favourites but also things that I have never even heard of. And it has fast become one of my favourite lunch stops in Exeter. We first starting going to Comptoir Libanais about a year ago. I visited it first with my auntie and little sister - and my auntie and I absolutely adored it. I ordered lamb kofte and fattoush salad (the classic combo) and, if I remember rightly, my auntie ordered a tagine. They had a kid's menu but my sister is a bit more of a pizza and burgers fan so she didn't appreciate the deliciousness as much as we did (although she did have a gorgeous hot chocolate that made us both jealous). My only qualm was the drink that I ordered - it was a rose lemonade but it was just too exotic for my taste and, since then, I have only ordered orange juice. But I did round the meal off with a slice of orange blossom cake which was divine. It had the consistency of polenta cake which I love so it did very well in my books. Then we didn't return for a few months as I went completely off anything that wasn't plain (pregnancy lols) but, when we did return, I decided to be adventurous. I was accompanied by my auntie, uncle, sister, and another sister (I have a wealth of sisters) and I was excited to share the delights of Lebanon with these Middle Eastern food virgins. This time, I ordered a tagine which was so gorgeous and it came with bread to dip in (yum). And, just like that, my love was rekindled. A couple of weeks ago, we went back again. This time it was just me and my auntie (and the baby). I was tempted to stick to the usual of lamb kofte and fattoush salad but I pushed myself to try something new - and I am glad I did. I went for the spinach and feta fatayer (which was like a soft pastry filled with spinach and feta and topped with sesame seeds) and that came with a salad. My auntie ordered fattoush salad with falafel and we shared a bowl of rice too. And, I can tell you, all I ever want to eat from now on is fatayer - it was incredible! But what warmed my heart even more than the lush food was the great service. Dining out with a baby can sometimes be a bit tricky but the staff made us feel so welcome. They fawned over Ava and she lapped up the attention. Her head was on a permanent swivel watching the waiting staff walk by smiling at her. And that just set me at ease so much because I knew we wouldn't be turfed out if she got a little noisy. The 0.5 deduction was only due to the lack of drinks that were to my taste but everything else was absolutely perfect. Lovely food and beautiful place. So important to feel nice and welcomed there by the staff. You can't beat a Lebanese feast! Exactly - it's the best!